At the ripe ages of ten and seven-and-a-half, my kids now understand that their clergy parents will grant them unlimited screen time on Sunday afternoons in exchange for remaining quiet enough for us to nap. They’ve actually grown to expect this screen time luxury. 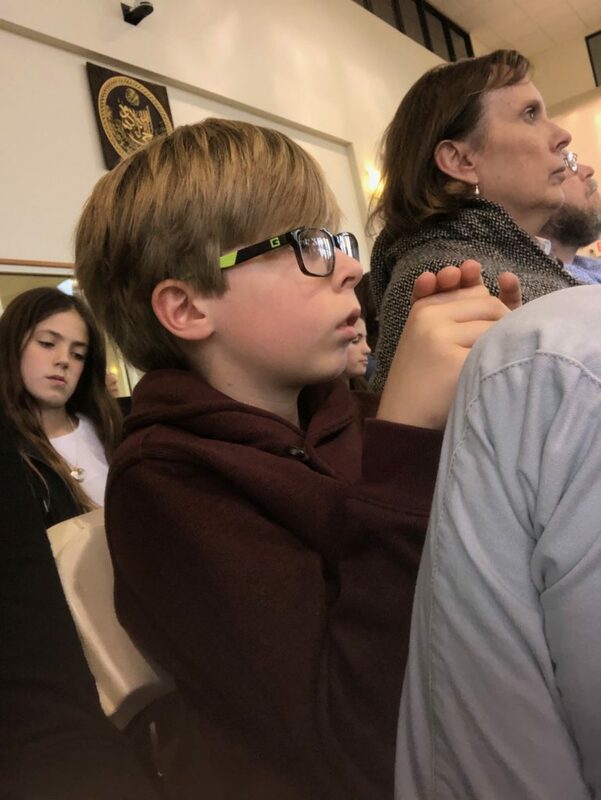 So, yesterday morning when I told them that we weren’t going home after church because we were instead driving to another city for a gun violence vigil, they were more than a bit disappointed. What do you mean we aren’t going home!? Will we get to play Lego Worlds when we finally get back? What about watching a Sunday movie like we do every week? There was indeed lamenting and gnashing of teeth. As a treat I took them to an art museum after church because we had an hour before the vigil began. I thought this was a brilliant idea because both kids love recreating Picasso’s cubism techniques, Matisse’s cut outs and Van Gogh’s swirls after learning about them in school. I was wrong. It was not a treat for them. Why? Because all they could think about was how the art museum and the scavenger hunt it offered children was most certainly not screen time. We left after forty-five long minutes and engaged in some real talk on the drive to the vigil. You know how this conversation went. 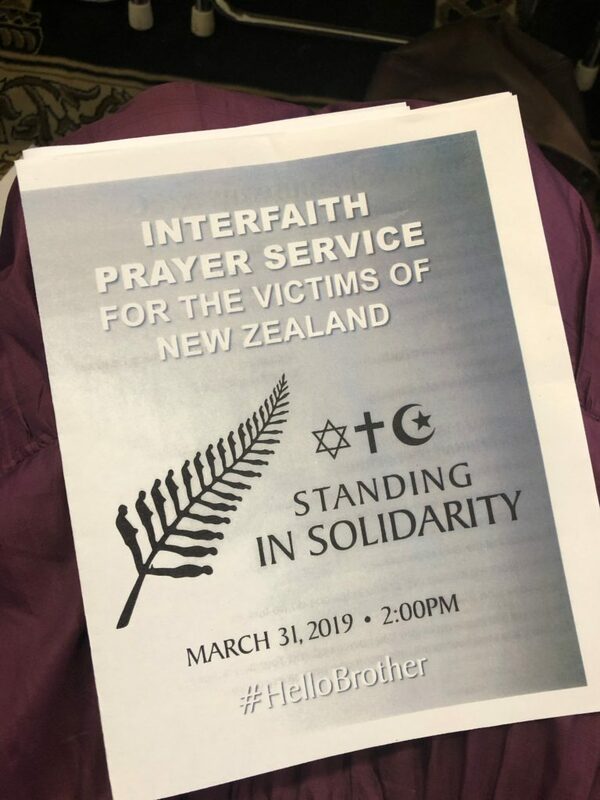 We are about to attend an interfaith prayer service for the victims of the Christchurch, New Zealand shootings two weeks ago. This vigil is far more important than playing a PS4 game or watching a movie. Do you understand? This was our first experience inside a mosque and I really didn’t know what to except beyond removing our shoes. We were greeted by multiple young adults wearing tremendous smiles, each offering their most sincere gratitude for attending. We found our seats and looked at the bulletin, reading through the printed names of the many Christchurch victims. The first name was Mucad Ibrahim, age 3. 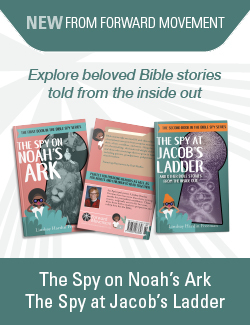 My daughter looked up at me and asked if a three-year-old was really killed while praying. As I answered yes, she immediately understood while we were there. We listened to Arabic prayers from the Quran, the three of us swaying in unison to the hypnotic chant. We heard an imam, rabbi, and divinity school dean preach about the pervasiveness of Islamophobia and the ways in which we must curtail it. They lamented the fact that the only time they come into one another’s houses of worship is after a horrific event like the one in New Zealand. My justice seeking ten-year-old hung onto every word. But when the divinity school professor directed her closing lines to the white Christians in the room, he leaned in a little closer. She emphatically stated it’s not enough for white Christians to be aware of what’s happening, but that we must be “consciously alert” to the the pain heaped on our Jewish and Muslim siblings. Our awareness of what’s happening must stir our conscience to action. Meanwhile, my empathetic eight-year-old crawled into my lap, burrowing her head into my shoulder so I could squeeze her tightly. I learned on the drive home that the topic was “just too sad so (she) turned off (her) hears and instead counted all the different hats.” She was captivated by the colorful scarves, the different styles of taqiyahs, and brightly stitched yarmulkes. Her call to action was different than my son’s, but just as powerful. With her ears turned off, she looked around the large room, soaking in the beauty and diversity of God’s peaceable kingdom. As we exited the service, I overheard my daughter thanking every person she saw wearing a name tag for letting us pray with them. I saw my son lost in thought, mulling over everything he had heard. Our discussion on the drive home was easy and rich and meaningful. We shared the many ways our worship spaces and prayers were similar and noted a couple things that seemed different. We brainstormed ways we can be consciously alert and how to respond when we see something that calls for our action. It was a long Sunday, but such a fulfilling one for all three of us. And yes, they even got to play an hour of their precious video game when we finally returned home. Brilliant!! Fine, if challenging, opportunity for real learning we’ll described, thank you, all three!